A good story can thread its way into our lives and not release us until it is told. 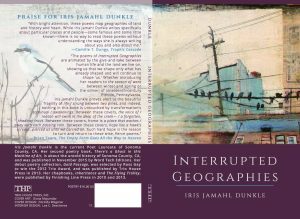 So it is with the prominent narrative behind Iris Jamahl Dunkle’s newest book, Interrupted Geographies (Trio House Press, 2017). This is Dunkle’s third poetry collection, following Gold Passage, selected by Ross Gay for the 2012 Trio Award, and There’s a Ghost in this Machine of Air, and as well as two chapbooks from Finishing Line Press. The bones of Dunkle’s collection are made of stone. Broken into three sections, each is distinct for its subject matter but linked by common vocabulary and symbolism. Again and again poems bring forth mud and stone and light. Green describes the wood of houses built too quickly and girls who are tricked into prostitution. Blackness pervades, first as ink and later as oil. Each poem addresses the interrupted geographies, both physical and abstract, of the title. In the first section of the book, “Sky Parlor,” our speaker navigates the geography of motherhood. The past rumbles under the surface of a peace that must be fought for each day. “In Louder than the Sun,” the mother hints at the darkness beyond the present, as she dresses her kids. in the world, and in me. What follows in the second section is the story of the town of Pithole, Pennsylvania told by girls lured to the town under false pretenses, a washerwoman whose well turns to oil one lucky day, the only newspaperman, and the preacher who tried to save the bedeviled town. Once I started reading the book I couldn’t stop, so gripping is the narrative that moves from the quiet life of the speaker into the past of an oil boom town from 1865. This poem demonstrates Dunkle’s style well, with parenthetical italicized sections interrupting the poem. I at first railed against this, irritated at being given so many asides. However, as the narrative takes shape, form fits the function of what is being said here. Even the structure reminds us that interruptions are all around us. The third section, titled “Spring and All,” begins with a quote from William Carlos Williams’s poem, and demonstrates how the bucolic romanticism of nature is a lie. In the series “The Education of Islands,” Dunkle remembers time she spent in Sendai, Japan before the tsunami hit. These memories clarify that landscape, assaulted in the second section of the book, can assault us back, that the earth gives and it takes away. I skim through most books of poetry until something catches my eye, then read and reread a poem, savoring it. With Dunkle’s work, I read it like a novel, turning each page quickly to follow the thread of the narrative, awed by the depth of language and character. The second section held me most, but the first and third sections drew me back in as I found each tendril of meaning linking the old history of Pithole with the narrator’s life. It is a book to be read from beginning to end and then over again. On each reading, the meanings of these geographies, interrupted by our greed or our search for footing on a rocky landscape, deepen like fissures that beg to be explored.